Synopsis: Angular web apps can have a lot less code that JQuery ones, and be easier to follow. I took the source of an e-zine article from 2007 using an older version of JQuery, checked it into to GitHub and incrementally converted it to Angular. I’ve squashed that series of commits into on to make it easier on the eye (and hide all the mistakes I made en route), and you can see that here. It is worth perusing that commit for a few moments to see the comparison, and the sheer weight of code deleted. 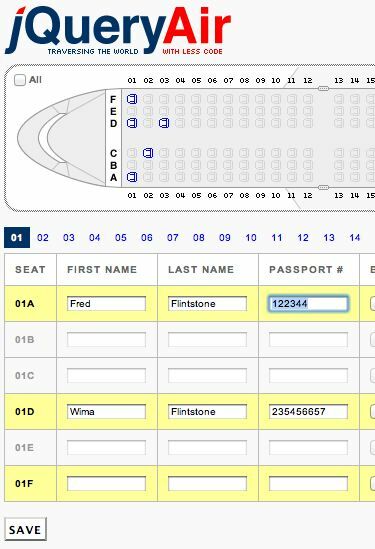 Please ignore the fact that nobody in real life would actually commission a seat plan app with this functionality. I’ve also appended a debug panel, that shows the two pertinent model objects in the app. You can see that live updating as you click around in the airplane image, and the passenger details. 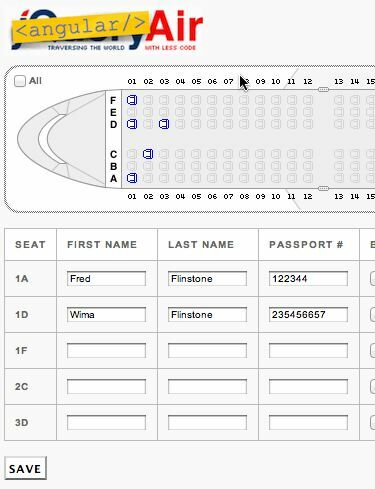 The reason I’ve had to compromise that the seats are rendered from a <li> tag within the HTML, and the are no grouping expressed within that list of 25 x 6 seat permutations. Un-orderd lists don’t have the ability to support groupings in a way that would be legal for HTML. The model in Angular has to support the view, and if it does not, then it has to change. Thus I flattened it. I would refactor my backend logic to be able to serve that up. If the app were to send the whole seat plan back to the server to persist it, I’d change that handling of that too, to support a receiving flatter seat list.